Twenty years from now, your child won’t remember what he or she got for Christmas. Instead, they will look back fondly on the time spent baking cookies with mom or drinking hot cocoa after playing in the snow. Don’t let this magical season pass you buy in a flurry of gift-buying and parties. Take the time to slow down and do simple activities with those that you love to celebrate the season. 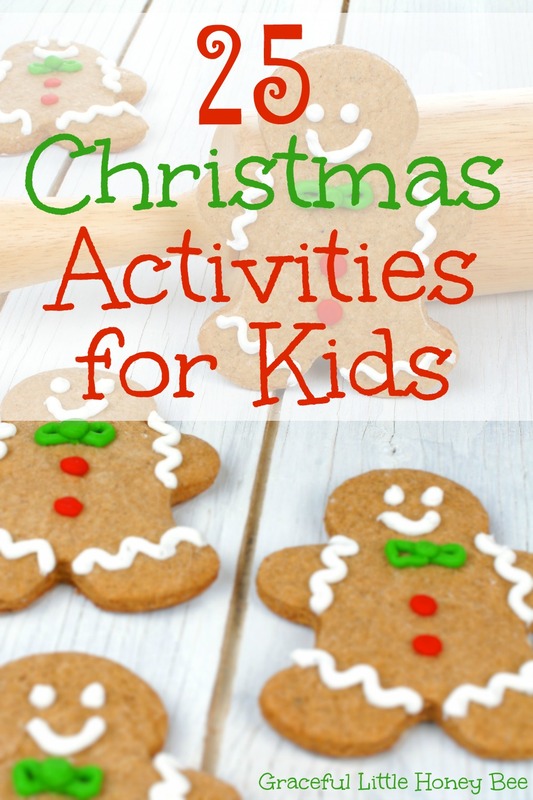 Enjoy these 25 Christmas Activities for Kids and don’t forget to download your free printable bucket list at the bottom of this post! Thank you for that cool printable. Our favorite family Christmas tradition is going to see the zoo lights and the Christmas lights at our botanical gardens. We also like to drive downtown Denver and look at all the lights on the buildings and homes. How fun! Thanks for sharing Cynthia. These are all perfect ideas for my kids. I really want to make sugar cookies, but I know it's going to be a disaster! I guess what matters most is that we're spending time together and they are having tons of fun! I can understand that feeling. :) It's so hard to just let go and let kids be kids. I love that you included doing something for Jesus, in all the busyness of the season it seems like presents and Santa take centre stage. For my family one of our favourite traditions on Christmas eve was to go to our church, and then drive around looking at all the different lights, usually followed by a Christmas movie at home. Every Christmas morning my dad would read the christmas story to us and we'd each take turns opening presents. So many good memories made! Favorite traditions: decorating tree, baking and decorating christmas cookies.